The Gretna, MB grain elevator, July 2014. Contributed by Steve Boyko. The Gretna grain elevator is a former Manitoba Pool elevator. It was owned by JRS Commodities and has a capacity of 6,800 tonnes. 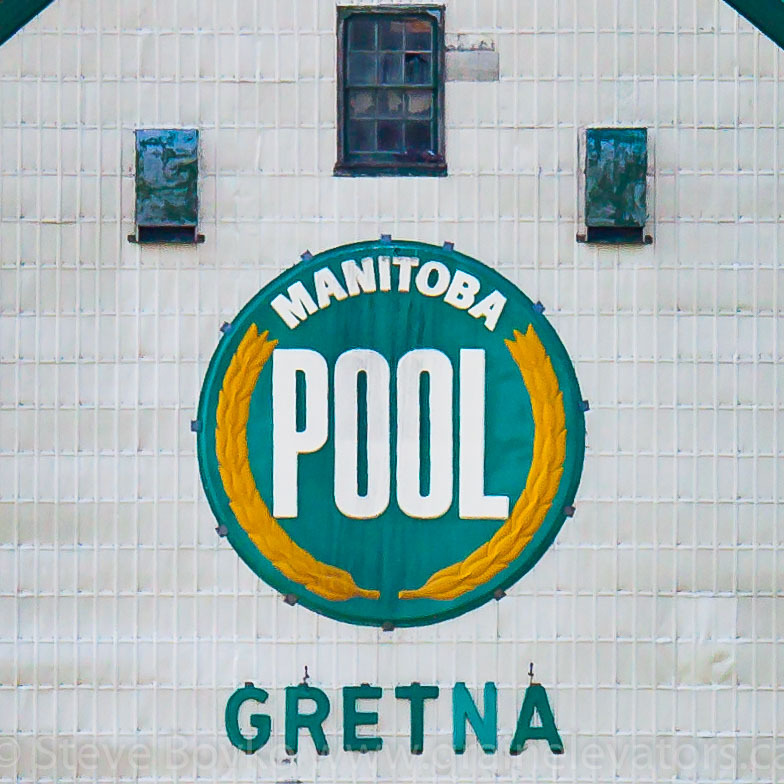 The Manitoba Pool roundel on the Gretna grain elevator. Contributed by Steve Boyko. 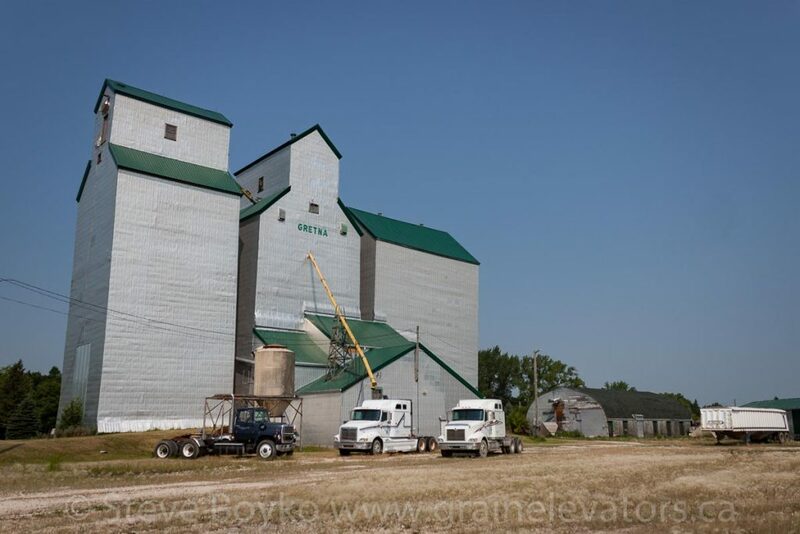 The elevator is composed of two grain elevators and an annex. One of the elevators is turned sideways and used as an annex. Gretna has no rail service but used to be on the CP Gretna subdivision. 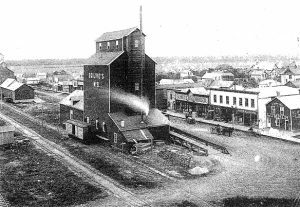 Ogilvie #8 grain elevator in Gretna, 1890. 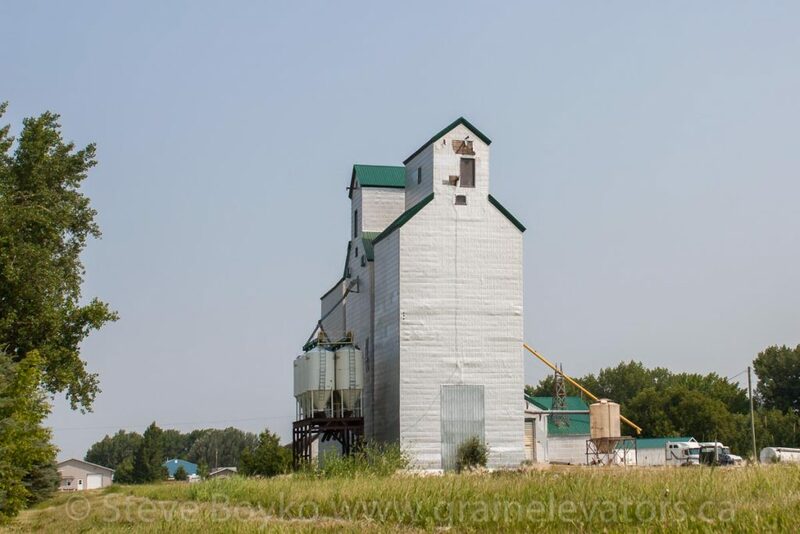 The first grain elevator in Gretna was the Ogilvie Milling Company’s #8 elevator, the first “standard plan” grain elevator in the West, built in 1881 with a capacity of 40,000 bushels. The photo at right features the elevator as well as the McBean Brothers elevator (built in 1884) in the distance. The Ogilvie elevator burned (along with much of Gretna) on April 28, 1913. 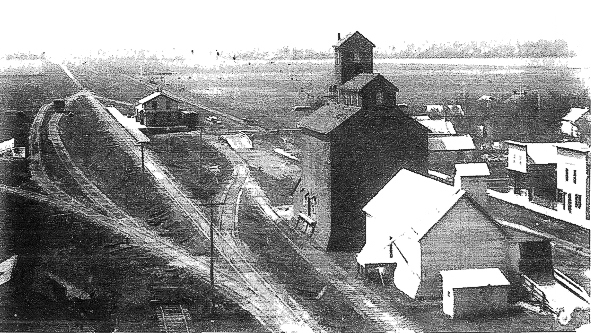 Gretna prior to 1910, showing the Henry Ritz elevator and CPR station. The last carload of grain at this elevator was loaded into CP 124002 on July 22, 1996 and the elevator was closed at the end of that month. 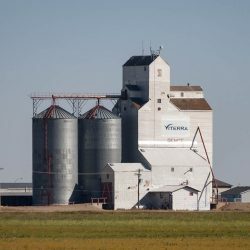 Greg McDonnell wrote a a great essay on the Gretna grain elevator in Wheat Kings: Vanishing Landmarks of the Canadian Prairies . The Gretna, Manitoba grain elevator, July 2014. Contributed by Steve Boyko. 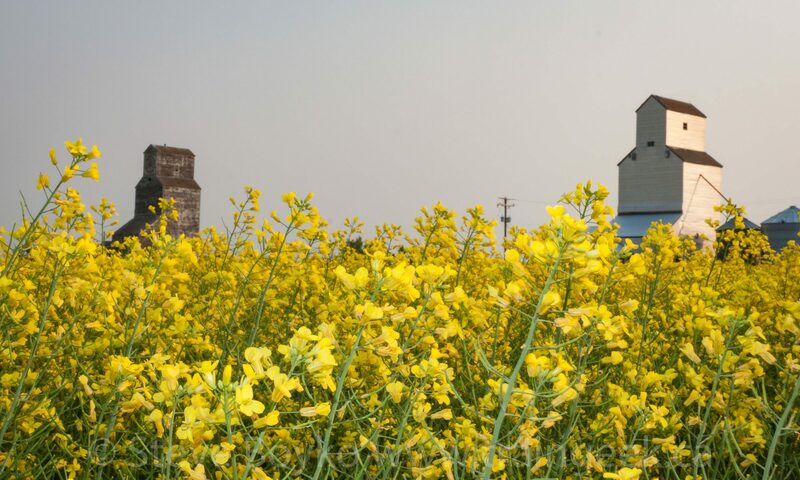 Many thanks to all the contributors to Gretna: Window on the Northwest which was the source for much of the historical information on Gretna’s grain elevators.